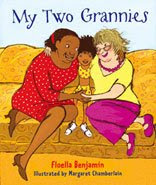 My Two Grannies by Floella Benjamin, illustrated by Margaret Chamberlain, Frances Lincoln. PreS-Gr 1 — "Alvina, whose mother is black and father is white, has two grannies who love her dearly: Granny Vero, born on Trinidad, and Granny Rose, born in Yorkshire." Milagros: Girl from Away by Meg Medina, Holt/Christy Ottaviano Books. Gr 4–8 — "The very first page hints at the loss of Milagros de la Torre's wonderful childhood home, Las Brisas, an island in the Caribbean ... the 12-year-old ends up on another island—this one off the coast of Maine ... this is an engaging and compelling tale of a fish out of water." Slant by Laura E. Williams, Milkweed. Gr 4–7 — "Petite Lauren, an eighth grader and Korean-American adoptee, is best friends with tall, blond Julie." Voss: How I Come to America and Am Hero, Mostly by David Ives, Putnam. Gr 7 Up — "...Ives blends laugh-out-loud inanity with real social commentary on U.S. culture—from clothing and celebrity to advertisements and eating habits—and the plight of immigrants." The Secret Story of Sonia Rodriguez by Alan Lawrence Sitomer, Hyperion/Jump at the Sun. Gr 8–10 — "California-born Sonia Rodriguez, 15, the daughter of illegal Mexican immigrants, is determined to be the first high school graduate in her family." Stop Me If You've Heard This One Before by David Yoo, Hyperion. Gr 9 Up — "Asian-American Albert Kim, 16, is extraordinarily successful at cultivating his status as 'intentional loser.' Having chosen against academic summer camp, he takes a cleaning job at a nearby inn." I was glad to see that two of the teen titles (Stop Me by David Yoo and Voss by David Ives) feature guys, and that both were described as laugh-out-loud funny. All six books were favorably reviewed, and Milagros: Girl From Away won an SLJ star.